Donations play a large part in successful animal rescue. Adoption fees do NOT come close to covering the various expenses involved in our mission. Presently, all of our received contributions are applied directly towards the ever-increasing veterinarian bills. The money allows us to spay and neuter, vaccinate, and treat many animals who have had a very difficult road and have significant medical needs. All of the vets at Academy Animal Hospital work very hard for rescue organizations such as ours. They do their best to give us reduced fees, but vet bills keep growing with every animal rescued. For now, our volunteers must use their own funds to feed the foster animals in their care a healthy diet, and often they splurge on toys, treats, or even a new litter box. Fostering is difficult enough... we appreciate the selfless act, and we must also acknowledge the monetary sacrifices they make as well. YOUR HELP IS NEEDED AND WILL BE GREATLY APPRECIATED. 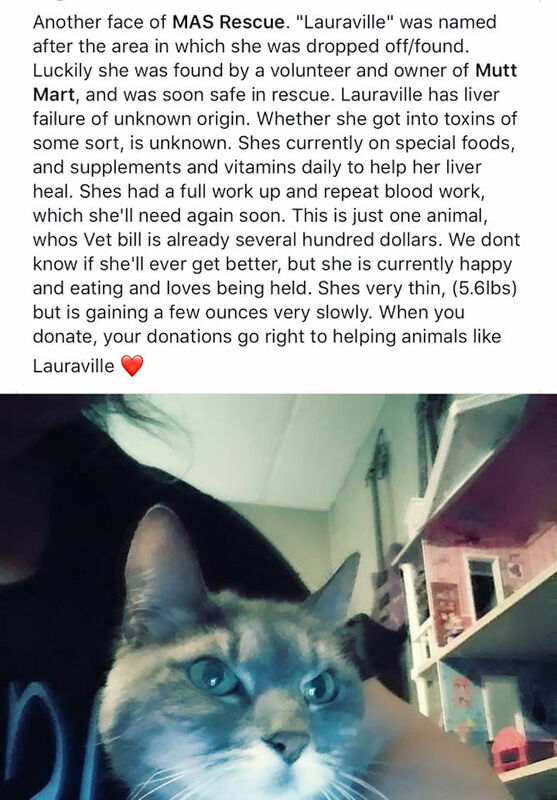 Lauraville - ANIMAL IN NEED! Make secure online donations by credit or debit card with PayPal. In addition, we can always use items to generate donations through fundraisers, like raffles and silent auctions. Items like gift certificates, wine, art, jewelry, etc. can help us raise money to care for animals. If you would like to donate items, please use our Contact Us form to arrange for pick-up. Shopping means a donation to MAS Rescue. It's just that free and easy. A $5 bonus for your first purchase and up to 26% of your purchases at over 730 stores like Amazon, eBay, Travelocity, Home Depot, Staples, and many, many more. Plus you SAVE money with exclusive coupons/free shipping deals. © 2010-19 MAS Rescue, Inc. - All rights reserved.